We start where it seems natural, for those just coming to this site welcome! I am one of the owners here at Paragon City Games and love to think about and play games. I primarily play Magic: the Gathering especially Legacy. I have dabbled in wargaming (Warhammer 40k), Pokemon, Yugioh, Final Fantasy TCG, and general board gaming. When I have a chance, I will sit down and play nearly anything. When it comes to this article it will be released pretty much every Monday talking about several things, but certainly being focused on my thoughts on the given updates to Legacy or closely related formats. Don’t expect it to only stay there, but it is a very good place to start. As with all of this please reach out to either the shop or me directly (@jbrandersen on twitter) if you have comments or questions about anything I bring up in this article. On twitter this weekend I noted the indomitable will of APAC (Asia Pacific) magic players on their ability and desire to travel through a signal 10 Super Typhoon to play main and side events at GP Hong Kong. While I followed them to the convention center it almost was more to observe the situation and avoid just sitting in the hotel playing challenges. I really enjoyed my experience on Day 1 of the event playing 3 different Legacy side events and buying silly vintage deck components. On Sunday I only participated in one Legacy event. Three of the 4 events only reached the minimum of 8 players to fire, but each of them had some fun deck choices and surprises. Beginning with the last match I was caught by a silly Hymn to Tourach in game one that stranded me on 1 land for the first 4 turns against Grixis control. In game 2 I lost to a Back to Basics followed up by a Liliana, the Last Hope ultimate with no real end in sight as my hand was just enough black splash to make it unplayable. Round 2 of Sunday was against Humans, it was uneventful for him particularly as he mulliganed to 5 game one and was stuck on 1 land versus a turn 4 combo then game 2 was just about me having far more kill magic than he could handle. Match 1 was versus a miracles player who was just coming back into the format. He played some unique lines but was stuck on 1 plains game 1 and couldn’t keep up game 2. We discussed why he hadn’t brought in Gideon, Ally of Zendikar game 2 and a few other side board tips. I mostly tried to channel my inner Josh but knew that he would have done a better job explaining card choices. Saturday was significantly different but the main things to note are that I played against MUD once each tournament and only won once (though every time we had a game 3). Our very first match game 1 he ended with 3 Lodestone Golems in play (unwinnable if I try to combo out). I also played against Tezz twice and had a decent time in those matches. Remaining unique experiences here include the 2 burn players playing against each other and there being a Doomsday player that won at least a match. To say that I enjoyed the matches I played and the people I met was an understatement. It was great! Legacy is a living format worldwide. While the format itself is still alive there is significant pressure that I am seeing on both sides of the table. There are a lot of players selling out now or downsizing this part of their collection because of the lack of value in some play groups. Large events are starting to lose focus on the player and the enjoyment of the game and smaller side events are also somewhat lacking in what players want. I know that Jerry Mee (Leaving a Legacy) was a big proponent of bringing back on demand win a box style side events or participating in the 40 dual style events. I think having some more PTQ-like events for Legacy isn’t a panacea for the format but shows that TOs and Coordinators are listening to the players and providing a way for wider spread participation. For now, I would add my recommendation to that of several other content creators to be vocal about changes to side events that make sense and not make special plans to attend any GP just for side events. When the double up events were 4 rounds it seems more reasonable. For those counting, recent GP attendance is down as well. GP Hong Kong hit its cap but was still right around 1000 players. Both GPs at Richmond were sub 1000 (with legacy having more turn out than Standard) and several others both before and after these missed targets. I have to wonder if this is in response to how CFB is managing the events, or if it is more a response to the game in general right now. Does Guilds of Ravnica change any of this? We will see with GP Denver and GP Portland later this year, along with how SCG attendance changes. Let’s talk a little bit about our upcoming set release. I will be in Singapore myself for the prerelease but back in Utah for the release. A few of the most exciting toys for me include Assassin’s Trophy; Niv-Mizzet, Parun; and Thief of Sanity! Assassin’s Trophy is probably the most hyped card in the set at this point. It does everything. 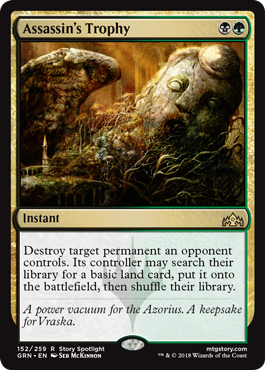 The words “destroy target permanent” make me so happy with Food Chain, I can have main deck answers to some of the cards that have been plaguing me for a while, and may have reason to break out my copy of Misdirection once again to get people with the shenaniganders. Let alone there is little to no building restriction I need to account for. This means that rock, nic fit, and BUG style control will see a slight uptick in metagames and one should be prepared for this card to make a break out at SCG Classics, the Las Vegas team open, and in challenges shortly after its release. I am looking at a 4/2 or 4/3 split with decay dropping a lot of the other incidental cards in Food chain and potentially running some number of Misdirection effects. This may also cause me to play spell pierce in the main deck. My first EDH (Commander) deck was Niv-Mizzet, the Firemind. The memories I have with this comboing people out, or just generally playing a fun value counter-burn style deck are immense. I sold it several years ago and have never had the heart to rebuild it. 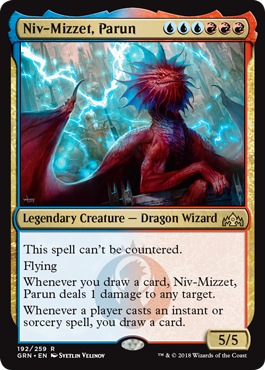 I think that now is as good a time as any with Niv-Mizzet, Parun. He has slightly more involved cost, but a more robust personality. He can’t be countered, he can start the combo off with any instant or sorcery instead of needing haste and has a slightly better stat line. Over the next few weeks I will work on developing a list to discuss and ask for your feedback. 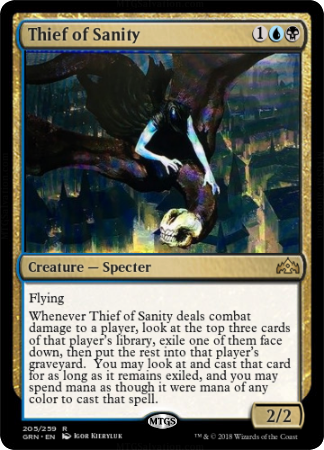 Lastly, Thief of Sanity really makes me want for find something fun to play it in. It asks for a shell that punishes your opponent for playing value spells. You get to choose their best cards to cast later, pitch it to force, and it is a 2/2 flyer for 3. Unfortunately, while considering legacy one must consider Baleful Strix. The 1/1 flier for 2 mana will be a formidable adversary. Strix completely blanks this newcomer, but when the specter is backed up by Walking Ballista and other ways to clear the skies there may just be hope. I know I won’t worry too much with my flying 3/3s, but others will have some issue dealing with this. Expect to see it make an appearance in some of my Flying Circus (Food Chain) lists soon and I hope to report that it adds meaningfully to the overall play style. Thank you for Joining me for this first outing into my musings. I hope you enjoyed some parts of it. I am sure that there are cards you are excited for in formats beside Legacy, let me know which ones and what applications. Look forward to some other articles this week as well as my next Monday Musings on the 24th, Farewell.